MamaEatsClean: What to do with all them Apples? Slow Cooker Sugar Free Apple Sauce - EASY! What to do with all them Apples? 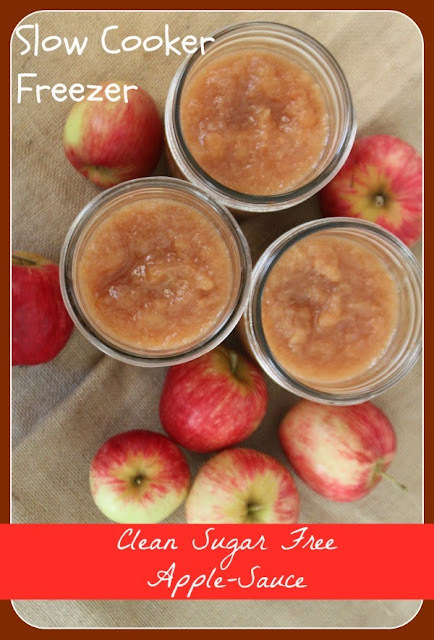 Slow Cooker Sugar Free Apple Sauce - EASY! Okay folks. One more preserve recipe before I get back to the baking and cooking. My neighbors gave me another huge bag of apples. Organic, fresh, sweet apples off their tree. Happy dance. If you don't have nice friends or neighbors with an abundance of apples you can also look into volunteering for a Fruit Share or a similar organization in your area. Or buy some at the Farmer's market. The kids love applesauce. I love using applesauce in their baking. Sugar-free. Organic. Chemical free. So of course I needed to make some homemade applesauce. But I wanted it simple. So here is what I did...................it was easy. Anyone can do it. 8 - 10 cups of apples, peeled, cored and chopped. As I was prepping the apples I put them in the slow cooker with the water and lemon juice mixture. About every 3rd or 4th apple I gave the pot a stir so they would get coated with lemon water and not turn brown. I slow cooked them on high for 3 hours (could take up to 4). I broke the sacred slow cooker rule and opened it up to give them a good stir once every hour. After the third hour the apples were bubbling and breaking down on their own so I didn't even have to mash them. I just gave them a good stir and I had applesauce. If the applesauce is browner than you like you can always add cinnamon to camouflage the color. I let the applesauce cool and then I put it in glass jars and froze it. If you are freezing in glass jars just make sure and leave a 1/2 to 1 inch of space at the top for expansion as it freezes. Voila - fresh, organic, easy peasy applesauce. Oh yeah - did I mention I love preserving fruit. Just about to make this recipe :) question: how long do you think the apple sauce will keep in the fridge?